As your kidneys fail, they tend to produce less EPO and so your bone marrow doesn't receive the message it expects, and production of red blood cells is reduced. You are now suffering from anemia as well as kidney problems. Although there are other causes of anemia, low levels of the hormone erythropoietin is usually the main cause among kidney failure patients. Iron is also important for red blood cell production, but iron is poorly absorbed from food, and much of the body's iron comes from the breakdown of older red blood cells. So loosing blood can increase the problem, and during each hemodialysis treatment you will loose a small amount of blood, further agravating the problem. Hemoglobin is the iron-containing complex protein in red blood cells which carries oxygen around the body, and it gives red blood cells their red colour. The standard test is a complete blood count - you have a sample of blood sent to a laboratory, the amount of hemoglobin in the blood is measured, as is the percentage of the blood that is red blood cells (known as the hematocrit measurement). These are then compared to the expected values for healthy men and women. The hemoglobin count is usually about one third of the hematocrit measurement. If the hematocrit measurement is less than 37% (33% for women of childbearing age) then a more detailed analysis is recommended, including tests for iron deficiency. Anemia starts early in kidney disease, typically when the kidneys are only working at about 45% of their normal capacity, and it gets worse in step with the kidney failure. 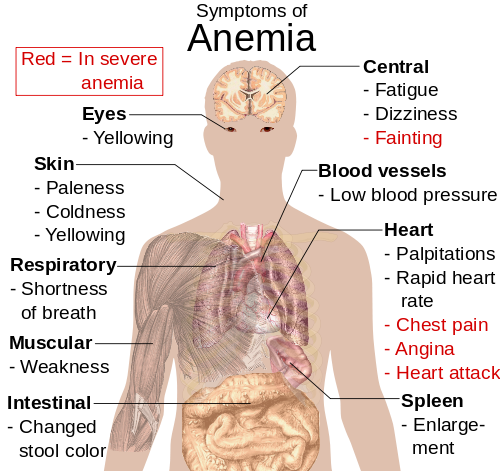 Nearly everyone with end-stage kidney failure has anemia. As a result, your blood will be carrying less and less life-giving oxygen, and you will suffer from fatigue, shortness of breath, feeling cold all the time, looking pale, headaches, and other symptoms of anemia. One related problem due to anemia is that your heart has to work harder to push more blood (and hence more oxygen) around your body. This can lead to enlargement of the left vertical of the heart - a problem known as left ventricular hypertrophy, or LVH for short. A large percentage of people with kidney failure also suffer from LVH. Luckily anemia can be treated. As a result of this, patients on dialysis are prescribed EPO while they are treated, and they may have the drug injected into the dialysis tubing or intravenously during dialysis. This reduces fatigue and increases your appetite, and helps improves your general health as EPO is also involved in the wound healing process. Patients may also be prescribed iron tablets or iron injections, as EPO alone may may not help if your iron levels are low (you can't make red blood cells without iron). You might be able to take a iron tablets, but many studies show that iron pills don't work as well in people with kidney failure compared to iron given intravenously. A small percentage of people have problems with iron injections and may need further treatment so they can tolerate the necessary iron treatment. A small number of patients may need vitamin B12 and folic acid supplements as well. Do talk to your renal diet consultant rather than just gorge on foods known to contain more iron, as they may cause other problems, due to other minerals present. And did you know that taking coffee or a high fibre diet while on iron treatment will result in your body absorbing less iron?